Cowell's Beach along with dozens of others statewide got a well deserved cleanup from the Save Our Shores organization along with the California Coastal Commission Cleanup Day and the Ocean Conservancy International Cleanup Day events. A lot of people spent Saturday morning packing up their umbrellas, fold-up chairs, towels, and sunscreen lotion to head out the beach in hopes of a great time in the recent beautiful sunny weather. But for thousands of local volunteers from the Save Our Shores organization, the day started with picking up cigarette butts, plastic cups, food wrappers and other mysterious items that would surely need the assistance of a pair of gloves. This year marked the 28th anniversary that Save Our Shores has participated in the beach clean up day at Cowell's Beach along with the California Coastal Commission Clean Up Day event and the Ocean Conservancy’s International Coastal Clean Up. And according to Save Our Shores program coordinator Rachel Kippen, the three of them combined makes up the largest volunteer event on earth. Some 3,500 volunteers collected 16,827 pounds of debris on Santa Cruz and Monterey County beaches, according to organizers. In Santa Cruz County, 2,354 volunteers cleaned 76 miles of beach, river, lake, creek and slough of 9,947 pounds of debris. Kippen has been with the group for a little over two months and likes what she has seen so far from the people that want to help keep the beaches clean and safe to be on. “We really appreciate having the local community come out and volunteer cleaning up our local beaches, our local waters ways, lakes, streams because all of that runs down to the Pacific,” said Kippen. A group of students from Independence High School in San Jose also made the trip and first time volunteer Jannat Thanh admitted that guilt took a part on why she helped out at Saturday’s event. Her friend from the group, Emily Gallardo, also came to help out for the first time and was interested in participating in the Save Our Shores event from an announcement in school. Another reason Gallardo and Thanh also helped out was because of an interesting theory they learned in class called the Great Pacific Garbage Patch, a landfill of trash that roams out on top of the surface and down bellow the floors of the cold sea. According to the Save Our Shores website, the top ten items that are collected during the beach cleanups from 2007–August 2011 are plastic cups (12,572), plastic bottle caps (17,967), glass pieces (28,083), plastic bags (28,454), fireworks (32,629), paper pieces (36,866), Styrofoam pieces (46,693), plastic food wrappers (66,381), plastic pieces (86,246), and in numero uno are the disgusting cigarette butts (228,776). And although Kippen is all about keeping local shops open and having tourist come hang out in the area, her effort to clean up the beaches also goes back to saving the environment for the oceanic wildlife. Labels: International Coastal Cleanup, Top Five Littered Items, What Can You Do? We've been posting on plastic ocean pollution all week in advance of International Coastal Cleanup Day, happening tomorrow. It's an amazing event that removes literally tons of plastic from coastlines and waterways around the world every year. Trash, and specifically plastic, in the ocean is a huge issue and it's fixable if we all tune in to our plastic use. Many people don't realize how big the problem is, or how harmful plastic is to sea life, so we made an infographic to lay it all out. Click here to download the PDF (10MB) or the image below to view full size. WAGENINGEN, The Netherlands, September 26, 2012 (ENS) – Plastic nanoparticles released when plastic debris decomposes in seawater can have an adverse effect on sea animals, Dutch scientists have found. Nanoparticles of plastic measuring just thirty millionths of a millimeter, invisible to the naked eye, are responsible for inhibiting feeding and growth in mussels, according to new research by Professor Bart Koelmans of Wageningen University and his research team. “The presence of plastic soup in the oceans is regarded as a big problem,” says Koelmans, a professor of water and sediment quality who is associated with IMARES, the Institute for Marine Resources and Ecosystem Studies, at Wageningen University. The plastic soup is formed when plastic debris decomposes in seawater. “Such particles are probably also released from cosmetics and from clothes in the wash, subsequently entering the sewage system and surface waters and eventually reaching the sea,” Koelmans explains. 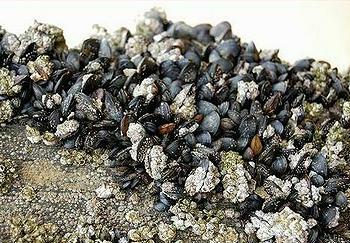 Koelmans and his team exposed mussels to various concentrations of nanoplastic in order to discover the concentration at which an effect was noticeable. They found that the exposed mussels eat less of their normal food, algae, than mussels that have not been exposed to plastic nanoparticles, and they grow less well. By giving the plastic nanoparticles color, and by measuring them using dynamic light scattering, it was possible to determine the particle concentration that exerted an effect on the test mussels. The researchers write that the extent to which the tiny plastic particles clump together is extremely important for understanding particle uptake and the resulting effects in marine organisms. “It means that those effects are not easy to predict because the biological availability of the particles can differ enormously from one organism to another, and because variation in water quality also plays a role,” says Koelmans. Very little is known about the effects plastic nanoparticles have on sea life. The effects revealed by this study do not yet prove that plastic in the North Sea is a big problem, but they do suggest that further research is extremely important, Koelmans said. This study is the first of four by Wageningen University and IMARES that will investigate the effects of plastic in the North Sea. The next will focus on the effect of plastic on lugworms, which lose weight due to uptake of plastic particles. The scientists have already found that as a result of their exposure to nanoplastics the worms take in more toxic substances such as polychlorinated biphenyls (PCBs), which bind to plastics, than worms that have not been exposed. Koelmans sees the need for research into other toxic substances that bind to plastic in seawater. In order to analyse the interaction of plastic and other toxic substances in the food web, Koelmans’ group has created a detailed computer model to estimate the risks posed by plastics in the sea. The final study in this series investigates the effects of plastic debris in the stomachs of fish. The analysis of hundreds of fish shows that 12 percent of them have debris in their stomachs and roughly half of that debris is plastic. Koelmans says the European Union and the Dutch government recognize the problem and the need to monitor the existence of plastics in the seas in order to learn more about present and future concentrations of plastic micro-particles and nanoparticles in marine environments. N.J. activists, lawmakers pushing bag bills. When you go into a supermarket, you are usually given a choice: paper or plastic bags to cart your groceries home, unless you are carrying your own reusable grocery bag. In some states, the choice could cost you a few pennies - including New Jersey, if bills pending in the Legislature become law. In what may be shaping up as a big battle in the fall legislative session, environmental groups and clean-ocean advocates are pushing lawmakers to either ban single-use plastic bags or charge consumers a fee if they opt for them. The issue emerged during a hearing this week on the decline of Barnegat Bay. Environmental advocates list - among a host of problems - plastic bags as a cause of rising pollution there. "They clog up storm drains so they don't function," said Jeff Tittel, director of the New Jersey Sierra Club. Conservationists argue that the bags and other plastics also are a big source of debris in oceans, posing dangers to marine life and sea birds. John Weber, Northeast regional manager with the Surfrider Foundation, said the United Nations estimated that 100,000 marine mammals and up to one million sea birds die each year from ingesting or becoming tangled in plastics in various forms. "Bans and fees work," Weber said. "Bag usage drops significantly whenever either is passed. In Washington, D.C., a five-cent fee curtailed plastic bag use by 60 percent within weeks. This not only reduces unsightly litter, it can also reduce the lethal impact on wildlife." Representatives of the plastics-manufacturing industry disputed that view, telling legislators Monday in Lavalette that plastic bags were more environmentally friendly than paper bags. "Paper bags have a lot larger carbon footprint than plastic bags," said Donna Dempsey, a spokeswoman for the American Progressive Bag Alliance. The American Chemistry Council supports that view. According to its website, using paper bags doubles the amount of carbon dioxide produced compared with paper bags; plastic-bag production requires less than 4 percent of the water needed to make paper bags; and paper bags create almost five times more solid waste than plastic bags. Nonetheless, several regions in the nation have enacted bans on plastic bags, including 50 jurisdictions in California, according to a memo from the New Jersey Office of Legislative Services prepared for the Senate Environment and Energy Committee. There are no statewide bans, fees, or taxes on plastic carryout bags, although legislation is pending, according to the National Conference of State Legislatures. Philadelphia considered an ordinance banning the bags, but the measure failed. In New Jersey, seven bills now in the Legislature concern recycling or phasing out noncompostable, single-use plastic bags, and offering reusable bags for purchase. Industry lobbyists dispute the allegation that most plastic bags are resigned to a single use, saying many consumers reuse them. Industry and business lobbyists argued that the sector was making strides in recycling plastic bags and that, instead of banning their use, the state should ramp up education efforts about the need to recycle. The effort to ban plastic bags could have an economic impact on New Jersey, Dempsey said, since there are 16 plastics-manufacturing facilities in the state, employing more than 700 people. Barbara McConnell, vice chair of the New Jersey Clean Communities Council, noted that the state already had a tax on litter-generating products. Plastics in the Ocean: How Dense Are We? This is Curtis Cove, in Biddeford, Maine, a newly conserved & protected habitat, part of the Rachel Carson National Wildlife Refuge. With very rare exception, all of this material washed in from the waves. Lobster trap vinyl scraps, bait bags, claw bands, bottle caps, coffee-cup tops, cable ties, plant pot fragments, dollhouse parts, inner tube chunks, a saw handle, coat hangers, a crate lid, an air filter, a car arm rest. On and on, anything you can think of. Horrifying, that the Gulf of Maine is this fouled. But perhaps expected in a plastic, throwaway world. What I didn’t expect was to find that if I were trawling the waters for surface debris, I would have missed about 95% of this. Why? Because most of this material actually sinks in the ocean. Almost everything that’s washed up at Curtis Cove came from the bottom of the Gulf of Maine, not the top. The range of consumer plastics straddles the density line of seawater. Seawater’s specific gravity (a common measure of density) hovers around 1.027. Generally speaking, anything lower than that will float, anything higher sinks. Polyethylenes and polypropylenes have specific gravity of about 0.900 to 0.970. They float. The other major plastics — styrenes, nylons, polyesters, polyurethanes, vinyls — range from about 1.050 to about 1.440. They sink. Once wave agitation knocks off the air bubbles clinging to or inside them, Coke bottles sink. Water bottles sink. “SOLO” drink cups sink. Nylon fishing rope sinks. Bait bags sink. Vinyl upholstery scraps sink. PVC pipe sinks. Plastic toys — mostly styrene — sink. In the relatively shallow continental shelves, auch plastics can bounce and roll along the seafloor for dozens or hundreds of miles, washing up in places like Curtis Cove. In the deep ocean, it’s a different story. In 1997 the container ship Tokio Express dumped 4,756,940 Legos into the sea off of Cornwall, England. Many washed up in Europe, none confirmed beyond Europe. The reason? After the air bubbles are out of them, they sink. And once they tumble and fall off the continental shelf, game over. They’re 2 miles down, or more. They’re not likely coming back. In fact, once it falls into the abyss, very little of this sinkable plastic is likely coming back. A 2007 study scoured beaches on Pacific islands, which of course lack a continental shelf.1 The only plastics found washed up on their shores were polyethylenes and polypropylenes. In a similar vein, research vessels don’t find many light polyethylene grocery bags floating in the deep ocean. Why? They’re bags — they collect sediment, get denser, and sink. Here is what the Rozalia Project is finding on the New England seafloor (Source). Down far from manta trawlers and the prying eyes of most ROVs, this polymer cascade leaches its plasticizers, maybe gets consumed, certainly changes abyssal benthic communities in ways that nobody has yet even seen, much less understood. The problem of plastic pollution is becoming known. Which is good. By now most people are familiar with the scenes of Hawaii’s Kamilo Beach. The trouble is, Curtis Cove shows that when it comes to seeing what our plastic culture is doing to the ocean, places like Kamilo — and sobering reports from oceanic garbage patches — are literally the tip of the iceberg. I must take a moment to give a nod of appreciation to Miriam Goldstein, whose ability to point me toward excellent & relevant plastic pollution research is unrivaled! 1 Rios, Lorena M., Moore, Ch. Jones, P.R. Persistent organic pollutants carried by synthetic polymers in the ocean environment. Marine Pollution Bulletin (2007) 54,1230-1237. 2 Morét-Ferguson, S., Lavender Law, K., Proskurowski, G., Murphy, E.K., Peacock, E.E., and Reddy, C.M. The size, mass, and composition of plastic debris in the western North Atlantic Ocean. Marine Pollution Bulletin (2010). About the Author: Harold Johnson lives in Saco, Maine with his wife and young daughter. A freelance copyeditor and writer by trade, he spends his free time studying archaeology, earth sciences, and the ways the natural and manmade world have mingled across millennia. Since May 2010, he has written on marine debris and plastic pollution as The Flotsam Diaries. Follow on Twitter @FlotsamDiaries. Have you ever felt like you lived in a dump and wished all the trash was miraculously swept away? Beijing-based artist Wang Zhiyuan helps us visualize what a whirlwind of trash, ascending into the air would look like in his piece entitled Thrown to the Wind. While it seems like a novel idea for trash to disappear into the skies, the reality is that we are all living with it on Earth — some more than others. You may have heard about the huge floating islands of garbage swirling around in the middle of the Earth's oceans. Much of that waterlogged rubbish is made up of plastic and, like Electrolux with its concept vacuum cleaners, U.K.-based Studio Swine and Kieren Jones are looking to put that waste to good use. As part of an ambitious project, they’ve come up with a system to collect plastic debris and convert it into furniture. The Sea Chair project hopes to create a win-win for the marine ecosystem and a fishing industry in crisis. Rather than collecting plastic that washes ashore or is snagged as by-catch in fishing nets, the team hopes to one day go where the trash is, collect and convert it to something useful while still at sea. Sea Chair envisions adapting fishing boats into floating chair factories that trawl for plastic and put it into production on-board. Fishing vessels could be adapted to trawl for plastic. Taking the notion of retro-fitting entire industries in its own image to an even more radical level, they also describe a future in which dormant oil rigs in the middle of the oceans are put to use for harvesting reserves of plastic trash that will eventually sink to the bottom of the sea. While many of the Sea Chair project's grand ambitions for the fishing and petroleum industries still remain far off, it has managed some more humble innovations to collect and convert waste plastic into furniture. The team created a contraption it dubbed the "Nurdler" to sort through tons of beached marine debris in search of pieces of micro-plastic called nurdles. Nurdles are pellet-like pieces of plastic about 4 mm (0.15 in) in diameter that wash into the sea from industrial facilities. According to the Sea Chair website, nurdles have not yet been injection-molded, making them ideal for production. The Nurdler is a bit like the Sea Chair project's equivalent of panning for gold. The team also created a combination furnace and hydraulic press which can fit on a small fishing vessel to create chairs from collected nurdles and other plastics while still at sea – or wherever. The press can also be used to compress collected seaweed by-catch into briquettes that can then be burned to fuel the furnace for chair production. geographical coordinates of the location where the plastic it is made of was collected. The first sea chairs popped up at the Furniture Fair in Milan earlier this year, but no information on future availability or pricing have been made public just yet. Protestors in Portland demonstrate against single-use plastic bags. Enacted October 1st, 2011, Portland’s plastic bag prohibition specifically targeted supermarkets with $2 million or more in gross annual sales. NEW DELHI (AP) — The government of India's capital is hoping that a strict ban on plastic bags will help the environment. After more than 170,000 people signed this petition, as well as a petition delivery to Governor Pat Quinn's Chicago office, the governor of Illinois vetoed a piece of legislation that would have prohibited towns in Illinois from enacting bans on single-use plastic bags. Labels: Abby Goldberg, Illinois, Plastic Bag Laws, Plastic Bag Wars, Plastics Industry, What Can You Do?